A catastrophe for Iowa farmers will not be just a catastrophe for Midwestern Americans. In the Iowa floods, we'll see more evidence of how the problems of weird weather (climate change) combine and ramify the problems associated with Peak Oil. In this particular case they lead to an inflection point sometime around the 2008 harvest season, which will also be our time of political harvest. These are not your daddy's or granddaddy's floods. These are 500-year floods, events not seen before non-Indian people starting living out on that stretch of the North American prairie. The vast majority of homeowners in Eastern Iowa did not have flood insurance because the likelihood of being affected above the 500-year-line was so miniscule – their insurance agents actually advised them against getting it. The personal ruin out there will be comprehensive and profound, a wet version of the 1930s Dust Bowl, with families facing total loss and perhaps migrating elsewhere in the nation because they have no home to go back to. Iowa in 2008 will be an even slower-motion disaster than Hurricane Katrina in 2005. Beyond the troubles of 25,000 people who have lost all their material possessions is a world whose grain reserves stand at record lows. The crop losses in Iowa will aggravate what is already a pretty dire situation. So far, the US Public has experienced the world grain situation mainly in higher supermarket prices. Cheap corn is behind the magic of the American processed food industry – all those pizza pockets and juicy-juice boxes that frantic Americans resort to because they have no time between two jobs and family-chauffeur duties to actually cook (note: reheating is not cooking). Behind that magic is an agribusiness model of farming cranked up on the steroids of cheap oil and cheap natural-gas-based fertilizer. Both of these "inputs" have recently entered the realm of the non-cheap. 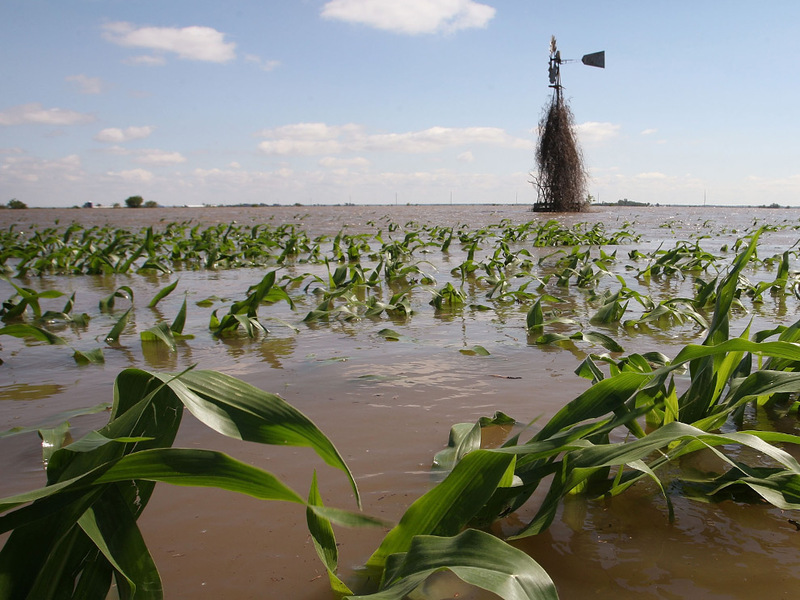 Oil-and-gas-based farming had already reached a crisis stage before the flood of Iowa. Diesel fuel is a dollar-a-gallon higher than gasoline. Natural gas prices have doubled over the past year, sending fertilizer prices way up. American farmers are poorly positioned to reform their practices. All that cheap fossil fuel masks a tremendous decay of skill in husbandry. The farming of the decades ahead will be a lot more complicated than just buying x-amount of "inputs" (on credit) to be dumped on a sterile soil growth medium and spread around with giant diesel-powered machines. Like a lot of other activities in American life these days, agribusiness is unreformable along its current lines. It will take a convulsion to change it, and in that convulsion it will be dragged kicking-and-screaming into a new reality. As that occurs, the U.S. public will have to contend with more than just higher taco chip prices. We're heading into the Vale of Malthus – Thomas Robert Malthus, the British economist-philosopher who introduced the notion that eventually world population would overtake world food production capacity. Malthus has been scorned and ridiculed in recent decades, as fossil fuel-cranked farming allowed the global population to go vertical. Techno-triumphalist observers who should have known better attributed this to the "green revolution" of bio-engineering. Malthus is back now, along with his outriders: famine, pestilence, and war. We're headed, it seems, toward a fall "crunch time," and that crunching sound will not be of cheez doodles and taco chips consumed on the sofas of America. I think we're heading into a season of hoarding. As the presidential campaign moves into its final round, Americans may be hard-up for both food and gasoline. On the oil scene, the next event on the horizon is not just higher prices but shortages. Chances are, they will occur first in the Southeast states because oil exports from Mexico and Venezuela feeding the Gulf of Mexico refineries are down more than 30 percent over 2007. Perhaps more ominous is the discontent on the trucking scene. Truckers are going broke in droves, unable to carry on their business while getting paid $2000 for loads that cost them $3000 to deliver. In Europe last week, enraged truckers paralyzed the food distribution networks of Spain and Portugal. The passivity of U.S. truckers so far has been a striking feature of the general zombification of American life. They might continue to just crawl off one-by-one and die. But it's also possible that, at some point, they'll mount a Night-of-the-Living-Dead offensive and take their vengeance out on "the system" that has brought them to ruin. America has only about a three-day supply of food in any of its supermarkets. The yet-more-ominous thing here is that shortages of food and oil are two fiascos that are pretty clearly predictable for the second half of the year. That's bad enough without figuring in the "unknowns" that could kick up American hardship a few more notches. The hurricane season just got underway – obscured for the moment by the bigger weather story in Iowa. The fate of the banks is a train wreck still waiting to happen. As it occurs – also heading into the high political and hurricane seasons – we could find ourselves not only a nation wet, hungry, and out-of-gas, but also completely broke. I'm sorry that Tim Russert will not be here to talk us through it all.